THE PAIN DISAPPEARED: Johanne Løvseth from Meldal was healed in the neck after more than 20 years with neck pain. In 2011, she was also healed of brain haemorrhage after calling the prayer telephone. Over the past few years, Johanne Løvseth from Meldal has experienced Jesus' healing power. The neck pain and stroke has disappeared after prayer. Johanne Løvseth from Meldal had for a great deal of her life struggled with neck pain. Especially the last twenty years her neck had been very bad. -It was difficult to find the cause of the pain. I hurt my back once when I was little, but I have had the pain throughout the years without knowing quite what caused it. I regularly went to get treatment, but I also learned to live with the pain. 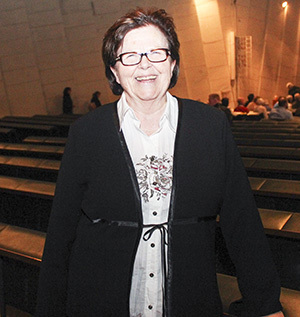 My job as a nurse did not make it much easier, says Løvseth. -Saturday April 20 she travelled to the Kirkelandet church in Kristiansund where Svein- Magne Pedersen was having a meeting. -While receiving prayer in Kristiansund, I felt a slight warmth in my neck, but nothing more happened. But on Monday the neck was actually worse than it usually was. Still, I did not get discouraged. I remembered Pedersen mentioning that some experienced getting worse before the healing occurred. This was exactly what happened in my case as well. On Tuesday she woke up without any pain, and since then her neck has been healed. Johanne Løvseth can also tell about something that happened in May 2011. She went into the garden when she came to a steep slope. -Suddenly I was so dizzy and I tumbled forward, rolled down the slope and I hit my head on the stone pavement. I was completely bruised, especially in the shoulder and arm. We went to the emergency room and took pictures in case there would be any fractures, but the head I completely forgot about. In August, Johanne began getting severe headaches. She called her doctor, but he would not do anything. It was only when she was at the chiropractor, where she told about the accident, that he thought she should have a head scan. She contacted her general practicioner again who agreed to her having a head scan. Løvseth went to the hospital and had a head scan performed. When she came home, she suddenly got an unusually severe pain in the head. She tried to call the doctor, but the line was busy all the time. Coincidentally the magazine «Healing» lay on the telephone stand. She called Svein - Magne Pedersen to receive prayer. -Unfortunately he was unavailable, but Pedersen had read a prayer into the machine that I listened to. Afterwards I lay down to sleep. When I woke up, all the pain was gone. Later in the day the doctor suddenly called. He was very stressed out and asked her to come to St. Olav's Hospital in Trondheim immediately. The images from the CT scan showed cerebral hemorrhage, and the pain in the head was due to the pressure that had occurred. -I told him what I had done, and the pain was gone. -I must tell the neurologist, the doctor said and hung up.Later, he called back and said that since the pain was gone in the head, the trauma was over. She would still need to get another scan later. -The new results showed no damage. In the time that followed I have had two scans that also came back negative. My doctor admits that it is hard to understand what has happened. He finds it curious. Regardless, I thank God for what has happened, she says pleased.